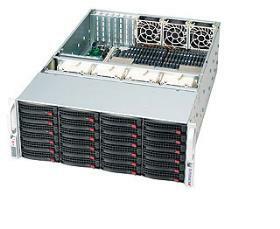 Acme AGQ-424TFR 4U Opteron 6200/6300 4-way storage server. option to add 24-port RAID controller to use all hard drive bays with best performance. 4U rackmount case with Redundant 1800W power supply (80 PLUS Gold Certified, 3 power modules). 24 of 3.5" HDD bays, SAS/SATA hot-swap, backplane included. Dimension Width: 17.2 in. Height: 7 in. Depth: 26 inch. Optional for 2x 3.5" Fixed Internal Hard Drive Bays. option to add CPU cooling kit per processor (1 to 4).